USB, Dual Head, Keyboard Emulation, Reads Tracks 1, 2 and 3. Includes USB cable. Color: Black. USB, Dual Head, HID (Requires HID Driver), Reads tracks 1, 2 and 3. Includes USB cable. Color: Black. USB, Dual Head, Keyboard Emulation, Reads Tracks 1, 2 and 3. Includes USB cable. Color: White. USB, Dual Head, HID (Requires HID Driver), Reads tracks 1, 2 and 3. Includes USB cable. Color: White. Fast and accurate reader. Good price. A little tight at first but cards slide through easily after about the first 15 swipes. The cable connection to the swipe could be more secure. This would only be an issue if the swipe is often handled rather than secured in place. We are a nonprofit organization. Our biggest fundraiser is a dinner/silent auction. Biggest complaint was how long the auction checkout was. The SureSwipe card reader worked great and helped speed up the checkout process. Great card reader to capture any card information. Just needs HID support on your software though. Device arrived in the mail and it took longer to unpack than it did to install. Swipes quickly and efficiently without a lot of set up. No programming required. Nice long USB cable. I bought this to replace a card reader at the front desk. I thought I would have the same problem with it not reading all cards, but it works great! Buying 3 more today! This product arrived quickly and was plug and play! They work great and the Barcodes Inc. is the best place to get them. Worked exactly as it should. Was able to read all types of magnetic strips on cards. Great product that works exactly as expected. No extra bells and whistles makes product dependable and easy to install and use. We use the readers in our fitness center to track gym usage and to verify that the person using the gym is a student or employee. We have several offices that need to track student visits that also use the reader. Works well as an input device directly to Excel & Access. We also use them with laptops to track attendance at big student events like orientation and career fairs. This device works perfectly with the Sitelink interface. There is truly no learning curve required. 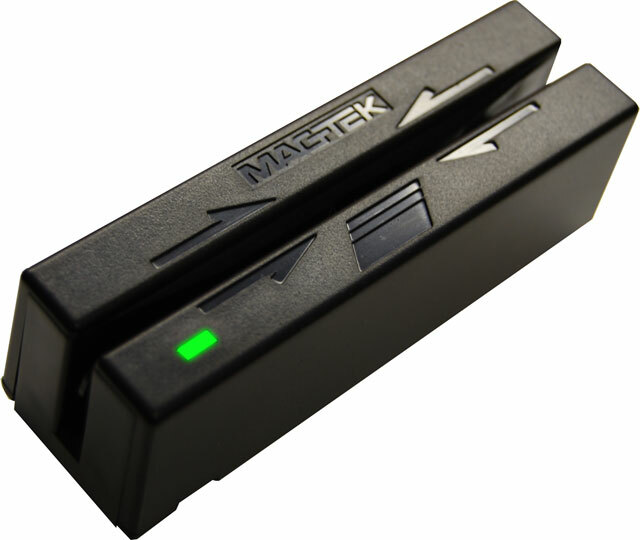 I used this MagTek swiper as a software developer to integrate card swiping into our software. I needed a card swiper that had an ActiveX control that was 32 bit and 64 bit compatible for all versions of Microsoft Windows. The HID interface MagTek models and their ActiveX control work on all versions of Windows, firing swipe events but not freezing other apps like the MiniMag Duo KB model. Because the ActiveX is a 32 bit interface, I compiled my interface module as an x86 32 bit application to write an encrypted cache file that my 64 bit app can sweep and pick up and process to banking institutions. Highly recommended for programmers needing a rock solid interface. I tried several manufacturers and chose the MagTek HID models.